Exploring fishing locations, and different species of fish in Philadelphia (and surroundings)! Join the World of Fishing today! Want to support EPF financially? Help me out with production and traveling costs?! Donations are always welcome via PayPal, or via my Patreon website! 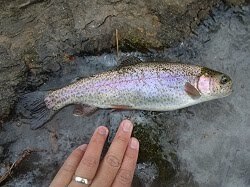 Here is my fishing report for January 24th, 2018. The 2018 Statistical Fishing Chart was updated as well. The Delaware Canal is a great Winter fishing spot, since it is one of the only bodies of water in southeast Pennsylvania with the Chain Pickerel (Esox niger) in it. And as it is known, the different species of fish in the Esox genus are very tolerant to low water temperatures -- making it a great target during the colder months of the year. A Chain Pickerel from the Delaware Canal. Winter of 2016. Taking all of that in consideration, I woke up early, prepared my fishing gear, and headed out in hopes of catching some chunky Pickerel down at the Canal. My main plan for the day was to cast a 3/8 oz. Z-Man white/chartreuse Chatterbait all around structure. Sadly, as soon as I saw the "current situation" of the Canal, my plans immediately got crushed. Not only the water levels were extremely low in comparison to the other Winters that I had fished there, but the canal was also still frozen due to the cold air (26 - 35F/-3 - 2ºC). The Delaware Canal. January 24th, 2018. To not waste the day, I decided to walk and cast where I could -- in-between the chunks of ice. But my efforts produced no results! After fishing for a total of 4 hours or so, I finally gave up and went home. Not a single bite; not a single fish. Heh. This is exactly when that old wise fishing cliche comes into play: "There is a reason it is called fishing, and not catching." And getting skunked is definitely a part of the sport! As you browse through this blog, please keep in mind that Extreme Philly Fishing (a.k.a. EPF) is all about recreational and sustainable fishing in the United States of America! EPF encourages an "educational approach." In other words, EPF believes that a good and positive fishing community can only be achieved by sharing proper information and educating anglers about the pros and cons of their actions. Good stewards of the sport know about the concepts of selective harvest and aquatic sustainability/environmental conservation; they know about the consequences of non-point source pollution (i.e. littering) and over-harvesting; they know about good manners and etiquette towards fellow anglers; safe fish handling skills for Catch-Photo-Release; etc. I hope you do enjoy the readings and the information that I have to offer here! And, of course, tight lines and FISH ON! E-mails may be answered in a range of 5-10 days to 3-5 months. Business e-mails will be given priority! The best way of reaching me nowadays is directly commenting under my YouTube videos. Note 2: Defamatory e-mails will be excluded without response. Further misconduct/wrongful behavior in all my social media platforms will result in a permanent block. EPF encourages freedom of speech - there's absolutely nothing wrong in expressing oneself; however, please - respect is good and everyone deserves it. Do Fish Hibernate? Truth or Myth? Water Surface Impact. Does it hurt the fish? Northern Snakeheads. A Friend or Foe? © 2011, Leo Sheng. All rights reserved. Powered by Blogger.